This is rare to see in Meta, but in Ask Ubuntu itself -- I'm sure I am definitely not the only one who's fed up with seeing short summaries in the question box. If you're asking a question, at least ask it! Not one of these is a real question! Taking 4 example questions -- they can be easily changed into real questions. How can I install the libvpx package successfully? How can I repair a damaged NTFS hard disk? (with more details, possibly). It also mentioned in Jorge Castro's video tutorial on making a high-quality question, but honestly - I wonder how many new users have even heard of Jorge? Or let alone the FAQ? I'm probably not in the position to point out any other solutions other than editing frequently and constantly reminding people to make the title into a question, but shouldn't it be more explicit when writing a question, or explicitly noted in the FAQ? I thought I would open it for discussion anyway. I'd like to hear some suggestions and opinions nevertheless. This is what you, and the rest of the community are for. We are all human robots who donate time to clean up the site. That's why anyone can edit, why editing is encouraged, and why low rep users will gain reputation for editing. It's an important part of the site and we expect users, as they become more invested in the site, to take up arms to edit, flag, and vote on questions and answers. We can't do much more than we already do for new users (they're given many popups and warnings prior to even posting a question or answer), if they choose to ignore it, as they often do, it's up to us as regular users to pick up their slack, edit, comment, and inform them of the ways of the site. Agreed. Question titles should be actual questions, ending with a question mark. The reason why we have so many bad question titles is because we have many new users and short-term users who aren't aware of the style guide. To be honest, I'm not too bothered about this: I can tell immediately if the question is by a new user and has not been edited just by looking at the title. This is quite a useful function for me. Questions shouldn't stay like that forever though: they should either be edited, or closed/deleted. The more important problem with most question titles is actually ambiguity, like in this example: "less/pager does not work". Let's edit question titles to improve both style and content. Congratulations! Welcome to the world of "local-repository"! Start submitting some edits to fix em up! I try to do at least 25 a day; but don't think of it as janitorial work. 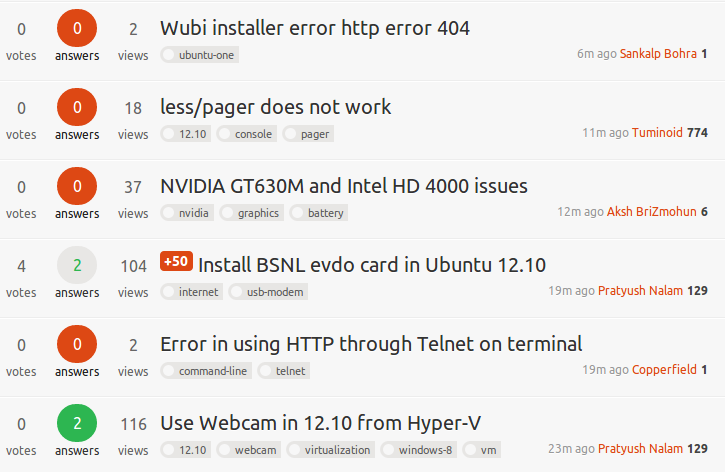 I've come to learn that my Ubuntu skills really sharpen up just by editing and being exposed to the huge amount of experts on the site. The bummer is if a title is horrible the body of the question is also likely to be horrible. And while it might feel bad/mean to downvote a question that a person has put no effort into, at least you can help out the next contributor by ensuring they don't waste their time. :) Some questions just can't be fixed by anyone but the person who is asking it. Also remember we're here to cultivate the collective knowledge of the community, so I routinely will butcher an old question to make it useful for the next person. As far as mentioning it in the FAQ, all new users are forced to read this page before asking their questions, so what you're seeing are people who already decided to skip/ignore that and post a terrible question. There's not much we can do about that, which is why voting is so crucial, bury the junk and let the cream rise to the top! Since posting my previous answer, I've come to the conclusion that it's not merely a matter of style. Question titles should be actual questions for a more important reason: it encourages users to keep only one question per post. I've seen many question posts that simply bunch all the problems and the questions the user is experiencing into one post. Dealing with these questions is difficult, so we should encourage users gently to separate unrelated questions. If they see a site full of questions titled with actual questions, they are more likely to grasp this intuitively. The reason is that the field on the form says 'title'. At least, that is what fooled me when I named my question 'forward sudo verification', even though I knew back then that we want questions as topic titles. I just edited it after being reminded by seeing this topic. Maybe this can be changed?